While Winter tends to be a quiet time of year for making pickles, it is undeniably a great time for eating them. Fresh local produce is harder to come by and the tangy flavor of fermented foods is a perfect accompaniment to hearty cold weather fare. When it comes to fermented vegetables, the Real Pickles staff are, as you may have guessed, enthusiastic and creative users of the stuff. I talked with some other members of our staff recently to get a sense of how they are incorporating Real Pickles into their meals. Katie, our fermentation specialist, has been on a tempeh reuben kick. Known to us all as an excellent cook, she melts some Swiss cheese on rye bread, adds some slices of Rhapsody’s tasty tempeh, and tops it with Organic Garlic Kraut and Thousand Island dressing (she makes her own by combining ketchup, mayo and a chopped pickle). “It’s an easy sandwich that you can make in a frying pan or a toaster oven,” she notes. Apples and sauerkraut are a popular combination among staff, especially in these colder months. Some thinly sliced raw cabbage, Organic Sauerkraut, chopped apple, feta and toasted walnuts tossed in a creamy dressing is a perfect crunchy winter salad. 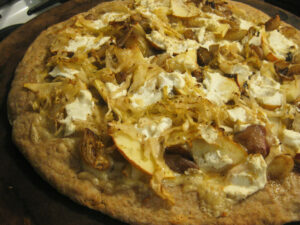 Another inspired example of this combination is the pizza that Dan and Addie have been making, topped with ricotta, gruyere, shallots, thinly sliced apple and Organic Garlic Kraut. Dan and Addie particularly like using the sourdough crusts from our friends at Berkshire Mountain Bakery. We are always impressed by the beautiful caramelized shallots when they bring in leftovers for lunch. In my own home, we make a version of the Real Pickles vegetable fried rice recipe at least a couple of times a month. We start by sautéeing lots of garlic, add some leftover rice, crack in an egg or two and then add whatever cooked vegetables we have around (carrots, kale and broccoli are always good). Sometimes we’ll throw in some frozen peas or green beans from our summer garden. We top it all with a big serving of Organic Asian-style Cabbage and some sesame oil. A handful of chopped salted peanuts tossed on top are an added bonus. Brendan, who works in the kitchen and is our source of outstanding homemade goat cheese, also makes a lot of stir fries and likes to add in some Organic Ginger Carrots at the very end, heating just enough to warm it all through. He also suggests mixing the carrots into green salads. Fermented foods are popular with staff for breakfast, especially as an accompaniment to eggs. A slug or two of Organic Tomatillo Hot Sauce on scrambled eggs has long been our favorite use for it. Annie, our lead production manager, likes to cover an over-medium egg with melted cheddar cheese and Organic Red Cabbage. Hannah also likes to precede her day in the Real Pickles kitchen with fried eggs for breakfast, topping hers with Organic Asian-style Cabbage.